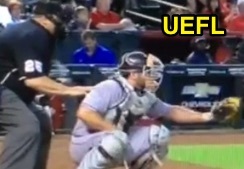 HP Umpire Fieldin Culbreth left Sunday's Rockies-Diamondbacks game after taking a foul ball to the left side of his facemask in the first inning of the Rockies-Diamondbacks game. With none out and none on in the bottom of the 1st, Diamondbacks batter Nick Ahmed fouled a 91 mph fastball from Rockies pitcher Jorge De La Rosa over catcher Michael McKenry, where it struck Culbreth on the left portion of his traditional-style facemask. Culbreth remained in the game until Chris Owings' one out at-bat in the bottom of the 2nd inning, when he left the game and was subsequently diagnosed with a mild concussion. 1B Umpire Jim Reynolds became the new home plate umpire and crew chief as 2B Umpire Manny Gonzalez slid over to first base, with 3B Umpire Paul Schrieber completing the crew. Culbreth previously was forced out of a May 15, 2013 game after a foul ball struck his collarbone in extra innings. Replays indicate the ball appeared to wedge between Culbreth's chest protector and facemask before falling to the side, indicating Culbreth may have received the full force of the impact due to a wedging action vaguely similar to the method of injury that once befell Ed Hickox, who successfully sued Wilson in 2011.